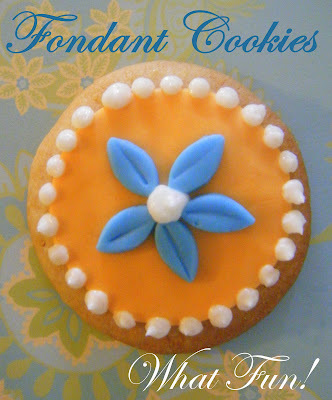 Whatever Whimsy: Fondant Covered Cookies! 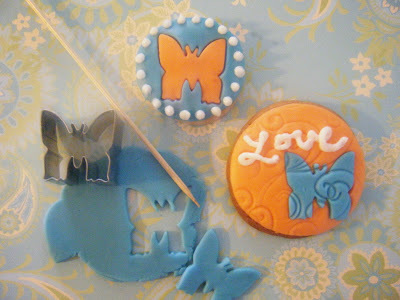 As I said, I was playing around with some of my leftover marshmallow fondant and decided to try my hand at putting it on some plain ole' sugar cookies. I amazed myself with the results! It was so easy and fun. I started with baked sugar cookies. (Don't tell anyone, but I made mine from a mix the day before) You could even buy store made ones and just decorate to save time. Next roll the fondant on a silicone pastry mat. I cut out the circles using a biscuit cutter, but any round cutter (or even a jar lid would work.) Just look for something the size of your cookie or slightly smaller. Then I used this cute butterfly cutter to cut out a shape from one color and traded it with another color (In this case, blue and orange). I did all the switching on the mat and then just transferred it to the cookie and pressed down slightly all around to get it to adhere to the cookie. I did not put anything on the cookie to get it to stick, it will on it's own. Also, make sure not to put sugar on the cookies before (or after baking) or you will not have a flat surface to work with. 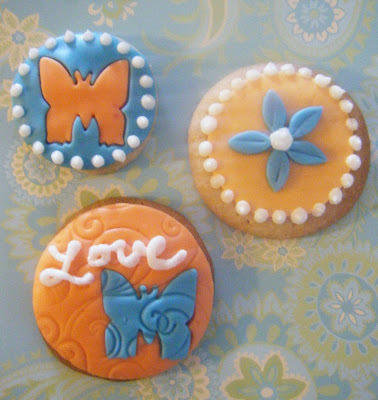 Now, on the swirly love cookie, I used a clean, acrylic stamp to emboss/stamp a design onto the fondant before transferring it to the cookie. I love, love, love, how this turned out! On the blue 5 petal flower, I used a small cutter for the petals and made the lines on each petal using a wooden skewer. You can make this shape with a round cutter, by first cutting out a circle and then overlapping the circle slightly with the same cutter to cut off just a small piece of the edge. I finished the lot by adding dots and writing with some white buttercream frosting, also left over from the baby shower cake making expedition! I hope this inspires you to create something of you own! AMAZING! Totally booking you now for Charlotte's 3rd birthday!